The Flash and Vibe comics of Geoff Johns. Reference is made to the dart that The Arrow used to stop The Reverse Flash last year. Why didn't they also use the serum Ray Palmer developed to slow down a speedster? Did Harry's ego get in the way? Caitlin and Cisco discuss making another attempt to "vibe" on wells after Cisco's first failed attempt, 20 feet away from Wells, through an open door. It's nice to see Barry's conflict in this episode be born of his being too impulsive and Grant Gustin playing tough is surprisingly effective. Tom Cavanagh doesn't get to do much in this episode past play straight man to Carlos Valdez... until the last speech when he gets to unleash all of Harry Well's anguish over his endangered daughter and his failure to save her. The best performance of the episode, however, goes to Shantel VanSanten, who continues to develop Patty Spivot into an amazing character as both Joe's partner and Barry's love-interest. Her annoyance at Joe's hiding something from her is well-conveyed and you'd think Joe would have learned his lesson about trying to hide things from people to keep them safe after.. oh, everything that happened with Iris in the last year. Regardless, VanSanten plays Patty as tough without catering to the cliched "tough female cop" tropes. The special effects for the sequences where Zoom drags Barry around are good. Harry refers to his daughter as "Jesse Quick". This is a nod to Jesse Quick - a superheroine and ally of The Flash in the original DC Comics. Jesse Quick is the code-name of Jesse Chambers - a superheroine who was the daughter of two Golden Age heroes - Johnny Quick and Liberty Belle. Jesse gained both of her parents powers - flight, super-speed and super-strength. Robert Queen being The Arrow of Earth 2 may be a nod to the New 52 version of Robert Queen, who had some kind of secret life as a master archer before Oliver Queen became the Green Arrow. It may also be a reference to the second Batman of the current New 52 Earth 2 comic, who is Thomas Wayne - Bruce Wayne's father. At the end of the fifth segment of the episode, the lightning as the screen fades to black before cutting to commercial is blue. We get our first clear look at Zoom's costume and it appears to be a black version of Barry's costume, save with the face completely covered by the mask and the lighting-bolt symbol on the chest reversed. This could be a reference to both The Black Flash (a manifestation of Death that attempts to lure speedsters to their doom) or The Rival - an evil speedster who modeled his costume on that of Jay Garrick, but in darker shades. The costume also resembles that of the New 52 Flash when he merged with The Black Racer, becoming the New God Of Death. Wells attempts to develop a serum that can reduce Zoom's speed. Cisco develops a gun that can transmit the serum into Zoom. Wells berates an employee for being unable to align the quantum helix. Patty notes that light energy can be manipulated to form hard light and make objects invisible. Dr. Light uses this later power to escape from STAR Labs. The STAR Labs building of Earth 1 runs on fiber-optics that transmit pulses of light. Dr. Light was able to hack into this from her cell, turning off the power dampeners and using her powers to become invisible. Cisco modifies the dart used by The Arrow to take down The Reverse Flash for his gun to bring down Zoom. Harry suggested using tungsten composites to dampen vibrations. Cisco admits this was brilliant. Cisco creates a set of gloves that allow Linda Park to replicate Dr. Light's powers. At the very least, it allows her to release focused light blasts. Terminal velocity is the highest velocity obtainable by an falling object. When objects are falling, their drag force equals the downward force of gravity, making the net force zero. In other words, two objects traveling against the flow of gravity, no matter what their original speed, will fall at precisely the same speed. Terminal velocity on Earth is 32 feet or 9.8 meters per second. Caitlin: Oh great! That could be this year's cold gun! Maybe another criminal could get it and then we'd have Sgt. Slow! Cisco: I would never let that happen. Sgt. Slow is a terrible name. Jesse Wells: I've never understood why you disliked him (The Flash) so much but now I know it's because he knew what you'd done. Harry Wells: What I've done at STAR Labs is change the world, Jesse. Unlocking the mysteries of the universe. And when you don't have the key to the lock? Sometimes you have to kick in the door (beat) You should get to school. Jesse Wells: Don't worry. I got my education today. Linda Park: I - I can't do this. I just don't have it in me. The Flash: That's not true. You're one of the strongest women I've ever met. You can do anything. Linda Park: And you know about me based on what exactly? Barry: ... because I know you. Patty: I trust you. I do. I wouldn't be your partner if I didn't. This is about you not trusting me. Cisco: The next time we do this I'm writing better dialogue. Iris & Caitlin: (in unison) Next time? Barry: It's - Wells - he said something to me on that video before he confessed to my mom's murder. He said that even if he was dead, that he still won because I wasn't happy. That I'd never really be happy. Joe: How the hell would he know? Barry: He knew me. He knew Future Me. Joe: That's Future You. This is the you here and now. Barry: I still think that Wells is right. Ever since I went back - to that night and I didn't save her - I didn't save my mom... there's just been this void in me, you know? I just feel like that's always going to be there. For better or worse, Wells... he knew me. Joe: Better than I know you? He may have stalked you for 15 years but I raised you. Look, Wells said what he said to you to mess with you. To get in your head one last time. If you listen to him, you let him win. Joe: You're responsible for your own happiness, Barry. Forget about Wells. Think hard about what you want. What makes you happy. Go out and get it. It's as simple as that. All right? Zoom: You like to fish with bait. I do too. Joe: Zoom sent you here like the others?! You kill The Flash and you get your daughter back?! The whole training montage with Linda learning how to use the Light Gauntlets Cisco built is painful to watch. Dr. Light reveals that her trying to kill Linda Park was born not out of a desire to replace her but to create a body she could use to convince Zoom she was dead. Caitlin makes reference to Captain Cold and his cold gun. Harry Wells' teenage daughter is a genius who graduated high school at age 15. Her name is Jesse Wells. He calls her Jesse Quick. Harry Wells knew Jay Garrick's secret identity back on Earth 2. Linda Park refers to the death of her editor in the last episode. Cisco refers to the dart used by The Arrow to stop The Reverse Flash in 122. A television broadcast Harry listens to in the flashbacks reveals that Oliver Queen's father, Robert Queen, is The Arrow on Earth 2 and had just had his secret identity revealed at about the same time Oliver was almost exposed as The Arrow on Earth 1. Oliver Queen apparently did die during the wreck of the Queen's Gambit on Earth 1. Earth 2 also has a Channel 52 News station, but this station has a male newsreader rather than Bethany Snow of Earth One. Linda Park cooks when she is stressed. Barry reveals his secret identity to Linda Park. Cisco sees Jesse Wells trapped by Zoom on Earth 2 when he vibes on Harry. By the episode's end, everyone on the team knows that Zoom has Harry's daughter as a hostage. Barry spins his arms into a focused tornado to create an air cushion to catch Linda Park after Zoom drops her off the STAR Labs roof. Barry attempts to throw lightning at Zoom, repeating his feat from 202. Zoom is able to flip over the lighting bolt, catch it, and throw it back at Barry. He also attempts to lure Zoom int a fist-fight in freefall. This too fails to work. 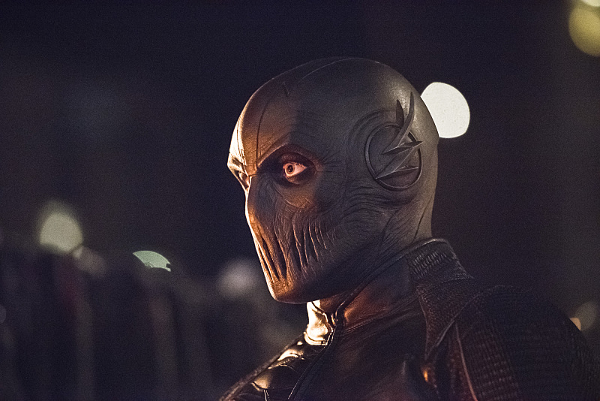 Zoom drags a defeated Barry before the press, the police and finally unmasks him at STAR Labs. Cisco is able to shoot Zoom, but the serum does not seem to slow him down at all. Until Cisco confirmed it with his vibe, Harry had no idea if his daughter was alive or not. Linda Park is said to be staying with friends in Coast City follow Zoom's attempt to murder her. At the end of the episode, Barry says he is unable to feel his legs. There's two flashbacks set in the Central City of Earth 2. Surprisingly averted. While Linda's failure at playing Dr. Light is played for laughs, Cisco gets just as much ribbing over the problems with his light gloves. And Linda and Iris gets some nice scenes together that pass The Bechdel Test. Granting that Cisco has always been the comic relief, even he seems to be uncharacteristically incompetent during his attempts to "vibe" on Harry and during the training montage for Linda. Cisco says it best - "The next time we do this, I'm writing better dialogue." The whole episode is a bit of a mess for the first 50 minutes and a clear candidate for the worst episode ever. It's pretty clear they were biding time until Zoom showed up. But once Zoom shows up, it's a whole other ballgame and everything is beautiful and only gets better until that cliffhanger.